European bank stress tests will themselves be tested on Monday when investors return to markets in Europe and Asia with a verdict on an unprecedented bid to restore confidence in the EU banking sector. Market reaction will be crucial to determine whether tests on the health of 91 EU banks, published on Friday, have dispelled suspicions that hidden problems and incorrectly priced risks lurk in their balance sheets. The unprecdented decision to publish detailed results of the tests follows the global financial meltdown and the crisis in Europe in the last six months, compounded by doubt about the solvency of some banks. The tests imagine a level of crisis arising from economic downturn, a stock market collapse or a government debt crisis, testing each bank and the system against the given level of distress. 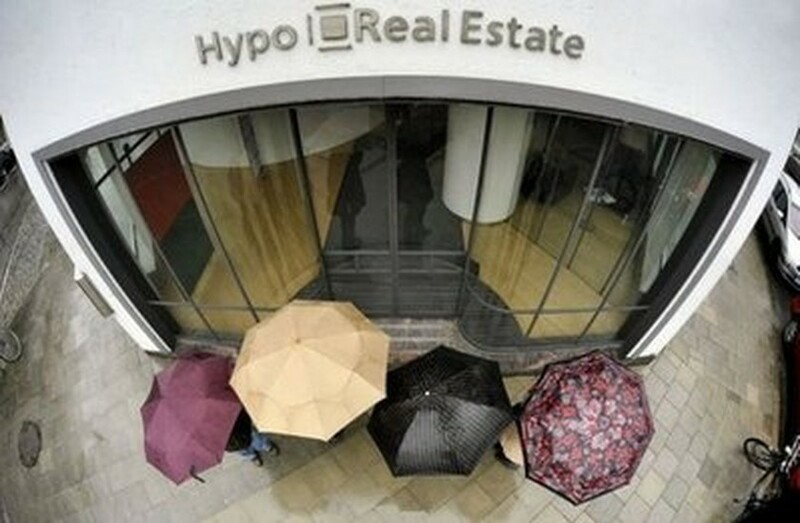 File photo shows people standing outside the headquarters of Hypo Real Estate bank in Munich, Germany. The results found that only seven banks, five in Spain and one each in Germany and Greece, were unprepared to absorb a new financial crisis. But analysts were instantly dismissive of the tests, saying the bar was too low to assess the capacity of European banks -- many of which hold bonds issued by debt-riddled governments -- to overcome fresh financial pressures. European bank regulators took the unprecedented step of making the results public, although they delayed the release until after stock markets had closed in Europe. On Wall Street, however, where trading was still going on, analysts said investors were in general relieved by the findings. The Dow Jones Industrial Average ended the day on Friday with a gain of 0.99 percent. Investors in Asia and later in Europe will have their say on Monday. "The market reaction is likely to be one of some disappointment," said Marco Annunziata, chief economist at UniCredit Group. He said the overall capital shortfall uncovered by the tests on the 91 banks, 3.5 billion euros (4.5 billion dollars), "is so small, and so out of line with prevailing market expectations, that it will be regarded with some scepticism." He described the testing exercise as a first step toward transparency "but insufficient to bring about ... rapid and major improvement in confidence in the European banking system." The underlying worry is that if banks in general become nervous that their neighbours have potentially dangerous weaknesses, they could become increasingly reluctant to do business with each other. They would also park funds in safe places, rather than lend normally, in case a link in the banking system becomes insolvent, sparking a domino effect and causing the interbank market to dry up. Suspicions about about the strength of banks have lingered since the end of last year and well up whenever there is talk of economic recovery faltering. This lack of confidence became acute three months ago when the Greek debt crisis showed signs of engulfing Spain, Portugal or Ireland. One concern was that governments with weaker economies -- having worsened their own deficits and debt by rescuing some banks -- faced a risk that banks might then not want to buy their debt bonds. Normally, banks hold and buy large quantities of sovereign bonds, considered low risk, easily convertible into cash and therefore representing a matching factor of top quality so-called Tier One capital that banks need to stay solvent. But the problem became so acute that the European Central Bank broke a golden rule and stood by to buy government bonds from banks that needed funds but had difficulty in borrowing on the markets in the normal way. The ECB was in effect both supporting the balance sheets of some banks, and also indirectly supporting the government bond market and therefore the ability of governments to fund overspending. The effect could be to overstrain the balance sheets of the banks as well as increase problems for governments selling bonds. This explains why one of the test criteria was whether banks could survive the shock of a sudden fall in the price of government bonds. But the stress tests did not involve the scenario of a eurozone country becoming insolvent and its bonds becoming almost worthless -- a fear in recent months given that Greek bonds are now rated in a less than investment phase. "The prospect of an outright sovereign default, which is what has worried markets most, has not even been considered," said Jennifer McKeown, senior European economist at Capital Economics. The stress tests are a legacy of the global financial meltdown that erupted in late 2008 following the failure of US investment bank Lehman Brothers, a victim of the subprime mortgage crisis. The chain reaction unleashed by that meant government around the world had to bail out banks to the tune of tens of billions of dollars, underwriting the banks' debts by borrowing extensively themselves -- through issuing bonds. A measure of the exercise's success should become apparent in the movement of two key interbank interest rates -- the Libor rate for dollars and the euro-based Euribor rate -- in the next few days.